The "Internet of Things" (IoT) allows for the deployment of many connected devices to sense, monitor, regulate, and actuate physical phenomona in our daily lives. As the IoT paradigm increases in popularity, the number of deployed devices continues to grow. To perform meaningful tasks, IoT components must collect, communicate, and analyze tremendous amounts of data. For a large enough number of components, the traditional, cloud fusion-center based computational environment becomes infeasible to implement, and, instead, we must rely on decentralizd, fully distributed, local computations to perform inference and data analysis. Compared to centralized data fusion centers, the small, numerous local devices connected to IoT lack sophisticated preventative security countermeasures. Consequently, distributed inference processes can fall victim to adversarial attack; data may be arbitrarily altered, snd computation may be maliciously hijacked. The goal of my research is to design fully distributed algorithms resilient decision making, computation, and analytics. Cyber-physical systems (CPS), systems of intercommunicating sensors and actuators attached to an underlying physical process, encompass large scale critical infrastructure and small mobile physical platforms. Increasingly, we rely on large scale CPS, such as the electric power grid and sewage removal systems, as well as small scale CPS, such as automobiles and mobile robots, in our daily lives. As these systems become more sophisticated, being compromised of many individual smart components that communicate over a network, they become exposed to cyber-security vulnerabilities that in turn cause physical, sometimes catastrophic, damage. The goal of my research is to develop security countermeasures for CPS. Traditional cyber security tools aim to prevent malicious intrusion and represent just a single layer of cyber-physical security. My work studies reactive security measures, which seeks to ensure resilient system behavior even after the traditional cyber-security layers have been compromised. Leveraging concepts from control theory and statistical signal processing, my research addresses problems such as intrusion detection, optimal attack design, and the fundamental limits of reactive security measures in general. Yuan Chen, Soummya Kar, and José M. F. Moura, "Topology Free Resilient Distributed Estimation," Preprint, pp. 1-13, Dec., 2018. Yuan Chen, Soummya Kar, and José M. F. Moura, "Resilient Distributed Estimation: Sensor Attacks," in IEEE Transactions on Automatic Control, Vol. PP, pp. 1-8, Nov., 2018. Yuan Chen, Soummya Kar, and José M. F. Moura, "The Internet of Things: Secure Distributed Inference," in IEEE Signal Processing Magazine, Vol. 35, No. 5, pp. 64-75, Sep., 2018. Yuan Chen, Soummya Kar, and José M. F. Moura, "Optimal Attack Strategies Subject to Detection Constraints against Cyber-Physical Systems," in IEEE Transactions on Control of Networked Systems Vol. 5, No. 3, pp. 1157-1168, Sep., 2018. Yuan Chen, Soummya Kar, and José M. F. Moura, "Resilient Distributed Estimation Through Adversary Detection," in IEEE Transactions on Signal Processing, Vol. 66, No. 9, pp. 2455-2469, May, 2018. Yuan Chen, Soummya Kar, and José M. F. Moura, "Cyber-Physical Attacks with Control Objectives," in IEEE Transactions on Automatic Control, Vol. 63, No. 5, pp. 1418-1425, May, 2018. Yuan Chen, Soummya Kar, and José M. F. Moura, "Dynamic Attack Detection in Cyber-Physical Systems with Side Initial State Information," in IEEE Transactions on Automatic Control, Vol. 62, No. 9, pp. 4618-4624, Sep., 2017. Yuan Chen, Soummya Kar, and José M. F. Moura, "Resilient Distributed Estimation: Exponential Convergence Under Sensor Attacks," in Proc. 57th Conf. Decision and Control (CDC), Dec., 2018. Yuan Chen, Soummya Kar, and José M. F. Moura, "Attack Resilient Distribute Estimation: A Consensus+Innovations Approach," in Proc. 2018 American Control Conf. (ACC), Jun., 2018. Yuan Chen, Soummya Kar, and José M. F. Moura, "Detecting Adversaries in Distributed Estimation," in Proc. 2017 Asilomar Conference on Signals, Systems, and Computers, Nov., 2017. 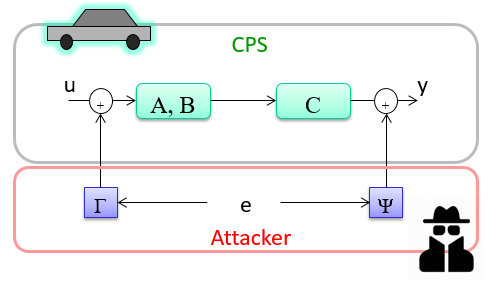 Yuan Chen, Soummya Kar, and José M. F. Moura, "Cyber-Physical Attacks with Control Objectives and Detection Constraints," in Proc. 55th Conf. Decision and Control (CDC), Dec., 2016. Yuan Chen, Soummya Kar, and José M. F. Moura, "Cyber-Physical Attacks Constrained by Control Objectives," in Proc. 2016 American Control Conf. (ACC), Jul., 2016. Yuan Chen, Soummya Kar, and José M. F. Moura, "Cyber-Physical Systems: Dynamic Sensor Attacks and Strong Observability," in Proc. 40th Int. Conf. on Acoustics, Speech and Signal Processing (ICASSP), Apr., 2015.